The Gallery of Shorthand, with permission of The Heritage Center of The Union League of Philadelphia, presents this rare opportunity to view the actual shorthand notes and transcript made by James Tanner of the events that occurred the evening that President Lincoln was shot. The Heritage Center of The Union League of Philadelphia is a source of fascinating information and exhibits. Click here, or on the book cover to the left, to view and read scans of the original Tanner Manuscript. Click here, or on picture to the right, to view and read a digitalized transposition of The Tanner Manuscript. The following summary description appears on that website. In 1865 Corporal James Tanner was a disabled Civil War veteran working as a clerk in the Ordnance Bureau of the War Department and living in an apartment next to the Petersen House in Washington, D.C.
On April 14th, President Abraham Lincoln was shot during a theatre performance at Ford’s Theatre. The mortally wounded President was taken to the Petersen House. Because he had stenography skills, Tanner was called into the Petersen House. 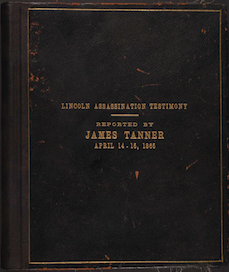 While Lincoln lay dying in the bedroom, Tanner sat in the parlor and recorded eyewitness testimony as given to Secretary of War Edwin Stanton and David Kellogg Cartter, Chief Justice of the Supreme Court of the District of Columbia. 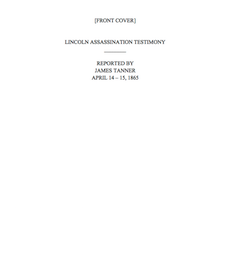 The interrogation of the witnesses took place between midnight and 1:30 A.M. “In fifteen minutes I had testimony enough to hang Wilkes Booth, the assassin, higher than ever man hung” noted Tanner. While still in the parlor, Tanner transcribed his shorthand notes into longhand, finishing his task at 6:45 A.M.